On the final day of the second series of hearings of the Royal Commission into Aged Care Quality and Safety in Adelaide, Commissioners Richard Tracey AM RFD QC and Lynelle Briggs AO heard that at least an additional $2 billion investment by the Government would be needed to reduce home care package waiting times to three months for all levels. Assistant Secretary of In Home Aged Care at the Department of Health, Fiona Buffinton agrees the wait for home care packages is too long and is the result of “unprecedented demand and growth”. She says in order to get all people on the waiting list engaged with a Level 2 home care package at a three month waiting period, an additional $800 million would need to be added to the current $2.6 billion home care investment. But this amount increases significantly if older Australians were expected to wait three months for a package that accurately reflects and meets their needs. “For everybody to get a package within three months, it’s probably in the order of an additional $2 - 2.5 billion per annum,” she says. When asked if she believes the Commonwealth Home Support Programme is effective in meeting the complex needs of older Australians, Ms Buffinton says “not at the present time”. With currently a minimum 12 months wait for a Level 3 package and above, it begs the question, how does the Department of Health prioritise older Australians who are at further health risk and need immediate support? 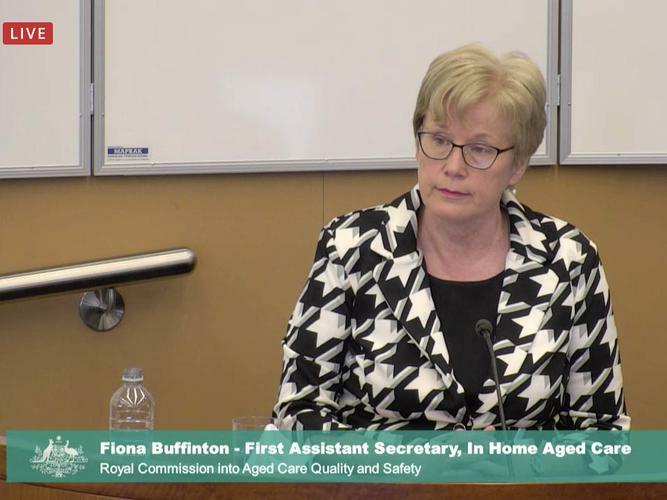 Ms Buffinton says elderly people of immediate risk and who have been assessed for a Level 4 home care package can be connected to a Level 2 home care package within a week or two, or Level 3 in a matter of eight weeks. She also agrees more can be done to ensure My Aged Care is an accessible, easy to use initiative, designed for the people it is meant to serve. Research conducted by the Department of Health has revealed 65 percent of people using the My Aged Care website have found it useful and met their needs, a stark contrast to evidence heard earlier this week. Ms Buffinton says hold times when phoning My Aged Care directly have reduced to under 30 seconds and the majority of complaints have been focused on the user experience of the call centre. So far this year, My Aged Care has fielded 1.6 million phone calls. Reminded of the evidence produced this week on the accessibility and experience of older Australians on the My Aged Care website, Ms Buffinton says other supports are available to connect people with the program. It was also revealed the My Aged Care website cost $40-50 million dollars to develop and between $20-25 million to operate. Ms Buffinton notes a more “fit for purpose’” My Aged Care website is set for launch this year and the department has been working alongside older Australians on website layout, use of white space for people with vision impairments and a logical flow of information. From February 2017, reforms to the home care package operations meant packages were provided directly to the individual, giving them choice and control over providers, however, lack of service providers remains a challenge faced by older Australians living in rural and regional areas. Ms Buffinton says the Department of Health ensures at least two active providers with consumers on their books are available in each location and able to provide in home support. She also acknowledges that the more remote the area, the more time it may take to receive home care or indeed, no support may be available. Hearings for the Royal Commission into Aged Care and Quality Safety will resume in Adelaide on 6 May.